Microhistory: Research using the web site "Bytown or Bust" (History and Genealogy in the Ottawa, Canada area) Microhistory: Research using the web site "Bytown or Bust"
can be searched using the dedicated Google search engine on every page. collaborate with other researchers and this site is updated on a more-or-less daily basis. 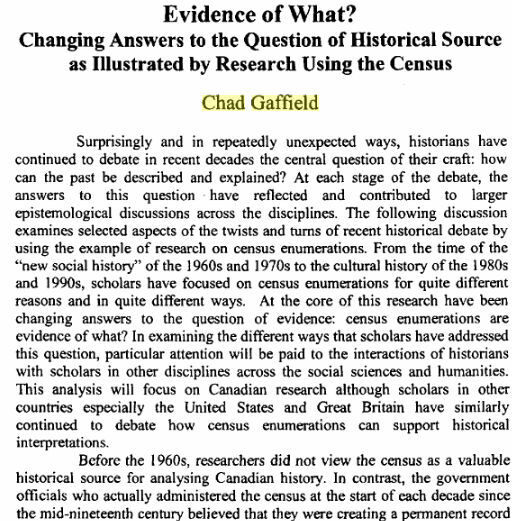 published by the University of Ottawa Press, 2005, pages 265-274.
by Chad Gaffield, Historical Papers / Communications historiques, vol. 17, n° 1, 1982, p. 172-195. "Canadian Families in Cultural Context: Hypotheses from the Mid.Nineteenth Century"
by Chad M. Gaffield, Historical Papers / Communications historiques, vol. 14, n‹ 1, 1979, p. 48-70. Other references to historical research in the Ottawa / Outaouais can be found in our bibliography.